We have 6 weeks to go before the book launch of our guide. We want you to know exactly what to expect from the book and to get to know the amazing people behind this project! Every week you will be able to check in on our website in order to find a new essay, article, artist or business from the guide. This weeks excerpt is about the artist Alessio Ceruti. Alessio has explored environmental issues in many of his artworks, using waste materials, metal sculpture and painting. In 2010 he moved to Bali, Indonesia, where he began to work with EcoBali. EcoBali is a registered operation promoting innovative strategies such as responsible waste management, educational programs and eco-products to raise awareness about environmental damage with local communities in Bali. EcoBali has worked on numerous projects with local artists and has succeeded in implementing waste management in Bali. This joint venture is a great example of how artists and start-ups can form collaborations for environmental progress. As our guide book presents artists in alphabetical order (so they can better be found 😉 Alessio Ceruti is the first one shown in the art section. The selected artwork by this young Italian artist is part of his series WHAT-ER Acque Acide. It visualizes the acidification of our oceans from the rising levels of carbon dioxide levels caused by pollution. 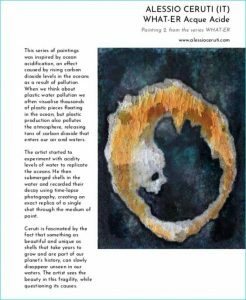 Alessio was interviewed by The Universal Sea (TUS) team about his motivation to work with The Universal Sea and how his role as an artist and his interdisciplinary collaborations can bring about environmental change. With our project, we believe that this gigantic problem of plastic littering can only be solved together – What attracted you to get connected to TUS? I have seen several things in common with TUS, you want to solve a problem that is close to my heart and that I have lived in the forefront of my being in Asia, that involves more parts to create a project and that you want to use the art to talk about this ! How do you see the role of an artist? An artist communicates emotions through his work, so his role is to transform an idea, a thought or a project into pure emotion. This means that it can be reached by more people. You have already worked interdisciplinary and got in contact with a recycling plant in Indonesia – how did you started? Living in Indonesia for some years I realized how enormous the problem of plastic was, but unfortunately it was not seen as such by the inhabitants. So, I started collecting plastic in the street and I used it for some of my works, but it was not enough. I tried to involve the inhabitants of my village by paying by weight what they collected, but it did not work. So I turned to those who were actually changing things by doing instruction in schools and villages for recycling and that took care of the whole process, as Paul of Eco-Bali-Recycling. It was enough to ask and a collaboration immediately started. With their contribution I managed to use different materials and learn some of the redevelopment processes. What were your expectations for the joint process? I’m sure that together you can change things! Creating synergies with those who think like you, you can get great results. Stay with the big ones to become great! Would you call it an art + entrepreneur’s match? What could you both achieve? What benefits came out? There is a lot to learn on both sides. For an artist to see the entrepreneurial side stimulates a new search for communication and development of the works, the same goes for an entrepreneur who can start to see things from a more empathetic and creative point of view. In our case we were already in tune, so I can say that it is a continuous mutual growth. How did the collaboration shaped your artist career? It made me even more empathetic regarding environmental issues. The line that divides the artistic side from the moralistic one is very subtle … my way of doing art is actually a denunciation regarding the social / environmental side while remaining an abstract language. In recent years I’m working on the concept of Change, as Climatic Change too, and on the fading of matter, focusing on genetics and quantum physics view. I like how evolution leads to a change which can be seen as adaptation to the territory and camouflage, and how thinking can influence this by changing our cells, DNA and the energy we produce and project all around us. The goal is to think of how a distorted or prospective vision could change the perception of our thought, create new memories and generate change. Paolo and I are working on a new project that is at the first stage of development. Certainly we will talk about education and great artistic projects. What should artists be aware of when beginning to reach out for entrepreneurs and businesses? We both have the same interests, the aesthetic, communicative and economic side and this must be respected by both parties. Once this is clear, everything is much simpler and more constructive. More about Alessio Ceruti can be found on his website. Stay tuned for more Weekly Excerpts.